New York State Gov. Andrew Cuomo delivers 2019 State of the State and budget address on Tuesday in Albany. Photo Credit: Newsday / J. Conrad Williams Jr.
Gov. Andrew Cuomo made that vow early in his State of the State and Budget address. These events always are vessels of optimism, brimming with the possibilities of a new year. 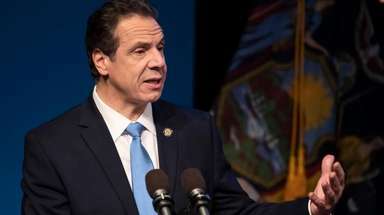 But Cuomo went further as his third term starts, evoking a new era of total Democratic control, which he said could lead to the most productive first 100 days in state history. There will be intraparty fighting and a suburban-urban divide, but already the State Legislature has set the pace in its first two days, passing a spate of bills on voting reforms and gender discrimination, its quickest break from the gate in many years. Cuomo’s timetable is tight, but a lot can get done in that time. And there is plenty in his ambitious agenda. But some things should not be rushed, and the governor and lawmakers would be wise to understand that. Hopefully, this era includes open dialogue and public hearings. The legalization of recreational marijuana, for example, seems inevitable, but we are encouraged that Cuomo projects no tax revenue from it until 2021. The complicated business, taxation, safety and health issues will take time to reconcile. The challenges to his $175.2 billion budget also are bracing. The state has a record-high number of jobs and record-low unemployment. But tax receipts are off. Federal government actions have hiked health care costs. Wisely, Cuomo did not mention single-payer health care; it might be the future, but this is not the time for that conversation. Budget goodies include a middle-class tax cut for two brackets of earners; a ban on plastic bags, which must include a fee on paper bags to work; and a long list of social and criminal justice issues. Also, a reauthorization and major expansion of the city’s speed camera program, a three-year extension of mayoral control of city schools, and a plan to toll East River bridges to reduce traffic congestion in Manhattan and provide extra funding for the beleaguered MTA. A school aid hike of 3.6 percent is a decent starting point, but the cage match over its final total and distribution between poorer and wealthier systems will probably be the defining fight of this session. Cuomo’s plan also includes an overdue ban on unsafe remanufactured limousines of the type involved in the deadly crash in October in Schoharie County. Some previous positions morphed, for the better — like restoring the power of the state comptroller to preapprove state contracts greater than $250,000. In acknowledging recent ethics scandals and advocating for ethics changes, Cuomo’s slide presentation featured headlines dealing with the conviction of a former top aide, but real ethics reform must go beyond recognizing the problem. Cuomo also hit his favorite piñata — the dysfunctional MTA. He lambasted its processes and structure, and no one is going to disagree with him on that, but he stopped short of providing a solution. If the governor wants total control, he needs to produce a plan on how he would do so. Then he can blow it up just as he did with the old Tappan Zee Bridge earlier in the day. Cuomo’s third-term agenda is promising. Now he and lawmakers have to deliver.